Stigma and shame have unfortunately become synonymous with teenage parenthood. In March 2012 the New York City Human Resources Administration's launched a highly offensive anti-teenage pregnancy campaign: “Think Being a Teen Parent Won’t Cost You?” Although the ads have mostly disappeared the shame and stigma teenage families endure everyday has not. In response to the offensive ads several New York City based organizations and advocates launched a counter campaign, "No Stigma No Shame." During one of the meetings the idea of a day long conference for NYC teenage parents was born and planning soon ensued. We are happy to announce on Saturday July, 13 the No Stigma No Shame: Empowering and Supporting Teenage Families Conference will take place at Four Times Square from 11am-4pm. This conference will connect New York City teenage families with a judgement free, supportive, and empowering environment which consist of other teenage families, organizations and programs that are teenage families friendly, and public and private resources available to teenage families. The keynote address will be made by a former teen mom, the distinguished Council Woman Annabel Palma whom represents the 18th District in The Bronx. Information sessions focus on emotional wellness, sexual/reproductive health, education, and advocacy as well as free raffle prizes, child care, and food! 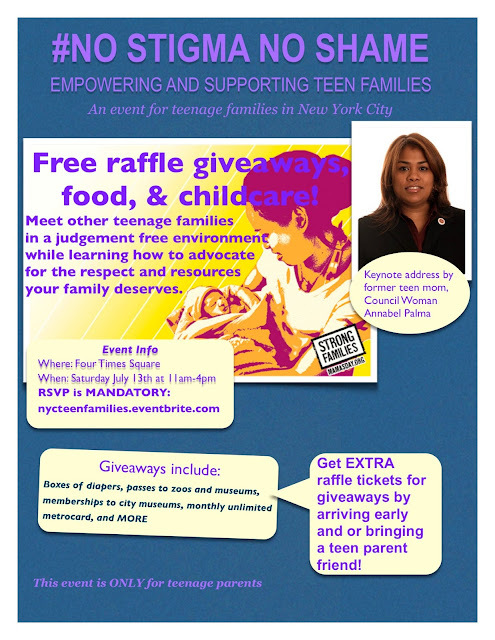 This event is free and open to all parenting and pregnant teens (male and female). RSVP is mandatory and can be done completed here. Teen Mom NYC, Resilience Advocacy Project, New York City for Reproductive Justice, National Latinas Institute for Reproductive Health, and several grassroot advocates and organizers.